Catholic Volunteer Network (CVN) fosters and promotes full-time domestic and international faith-based volunteer service opportunities for people of all ages, backgrounds and skills. As the leading membership organization of Christian volunteer and mission programs, we support and enhance the work of our members through volunteer recruitment, training and resources, networking opportunities and advocacy. Visit catholicvolunteernetwork.org to learn more. CVN member programs offer service opportunities in 46 states, the District of Columbia and 110 countries, with work placements in just about ever category imaginable. RESPONSE is an online database, printed directory and e-book of volunteer placements. Larissa redesigned RESPONSE in 2014, and her editorial design is still in use for the 2017 edition. She worked extensively with the vendor to produce, mail and prepare the print and e-book versions of RESPONSE. 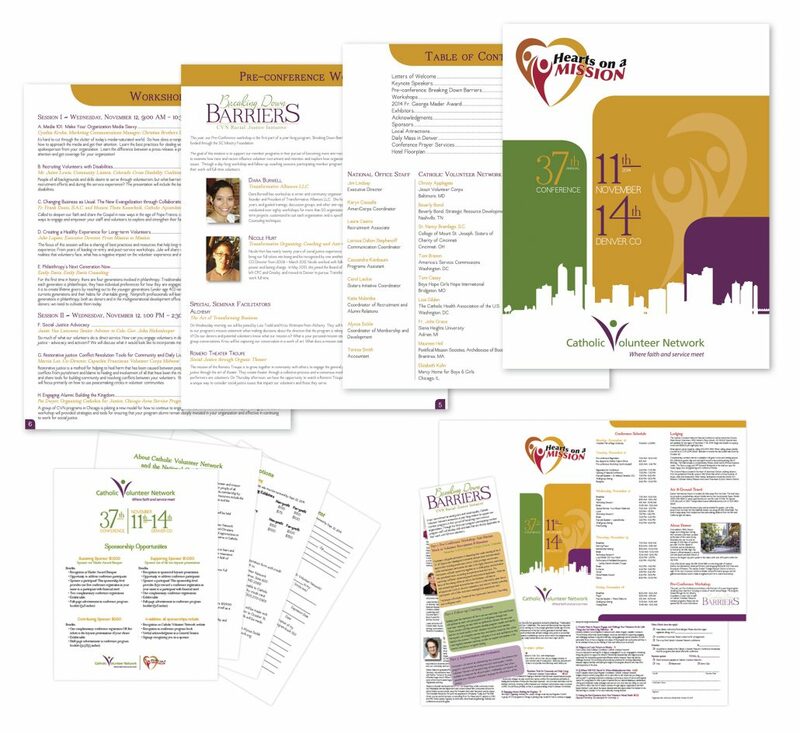 Larissa also updated CVN’s primary brochure in 2015 to share the directory branding. View the 2017 RESPONSE directory for an example of the editorial design implemented in 2014. Each fall, staff members of faith-based volunteer programs, campus personnel and other partners gather for the National Conference on Faith-Based Service. 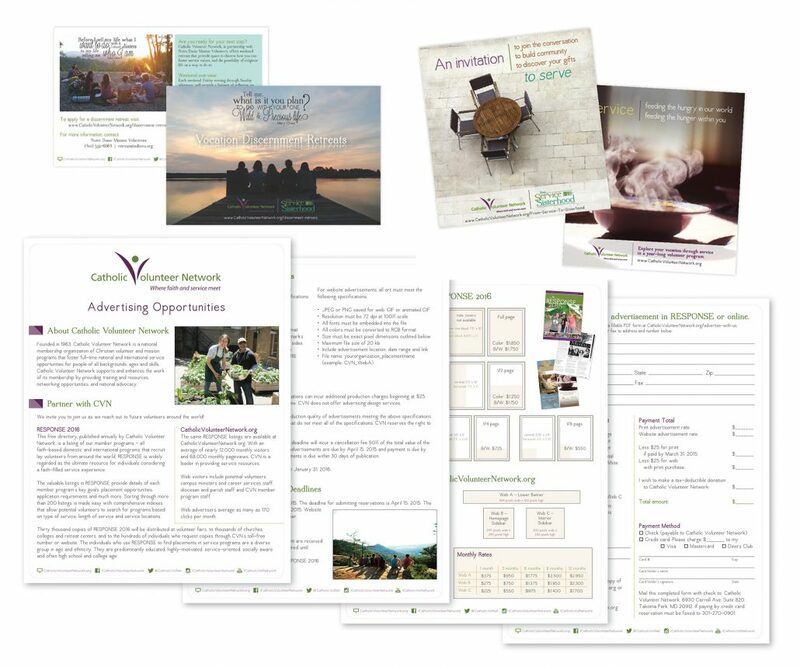 The theme and logo were determined by the local planning team, while Larissa designed the brochure, program, welcome packets and additional pieces – seamlessly blending the chosen conference branding with CVN’s brand. She also managed registration marketing and event sponsorships. CVN accepts advertising on the organization website and printed in the RESPONSE directory, as well as conference sponsorships and exhibitors. The organization also places website and print advertisements, particularly relating to grant-funded programs. While with CVN, Larissa managed the complete portfolio – specs, payment, scheduling and design – of both accepted and placed advertisements. Larissa also worked consistently with vendors to produce and mail marketing pieces like postcards and holiday solicitation cards. 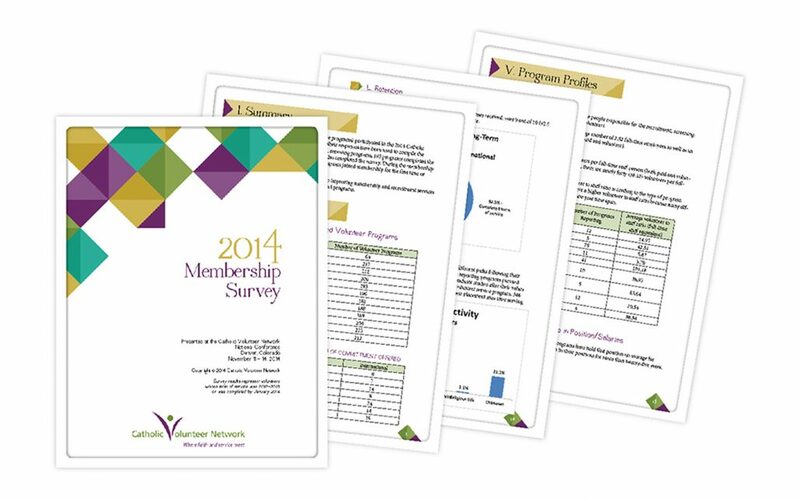 Each year CVN provides the results of the annual member survey. Larissa designed a new template for staff members to implement in conjunction with the organization’s rebranded annual report.